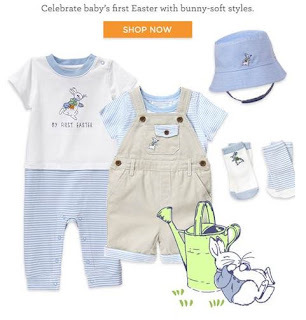 Gymboree's brand new Peter Rabbit collection! Peter Rabbit is Beatrix Potter's first and most famous character from her book. He is a young, impulsive, mischievous little rabbit, but really he has a soft heart. His mother is Old Mrs. Rabbit, and his sisters are Flopsy, Mopsy, and Cotton-tail. His cousin is Benjamin Bunny, and his uncle is Old Mr. Benjamin Bunny. He always wears a little blue jacket with brass buttons and a pair of shoes. His father had been put in a pie by Mrs. McGregor. One of the popular merchants that I have been having now featured the famous cartoon character that appeared in the Nick Jr TV Series. Gymboree's brand new Peter Rabbit collection specially designed for the littlest ones in your life. This collection is the perfect way to celebrate baby's first Easter with bunny-soft styles, sweet ruffles, and exquisite embroidery fit for a prince or princess. This one for your little boys. You can have sleepwear, jumper set, t-shirt and even socks in sky blue color. Adorable pink sets for your little girls. From head to foot, the cute rabbit is in. 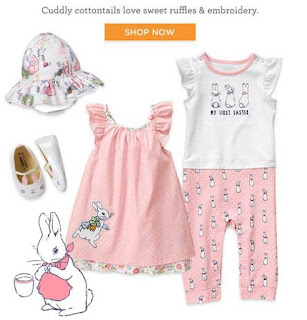 Shop the Brand New Peter Rabbit Collection from Gymboree and choose the best to wear for any occasions, or give it as a gift for birthdays, baptismal or holiday seasons. Peter the rabbit is cute. I really like this collection.